Well, this week has gotten away from me, so I'm resorting to outright theft (thank you, Pennsbury Manor and PA Lumber Museum) and a horrible pun. Earlier this winter, when there was snow on the ground instead of spring warmth in the air, Pennsbury Manor posted video of Bill the Ox cutting loose on a sunny afternoon. 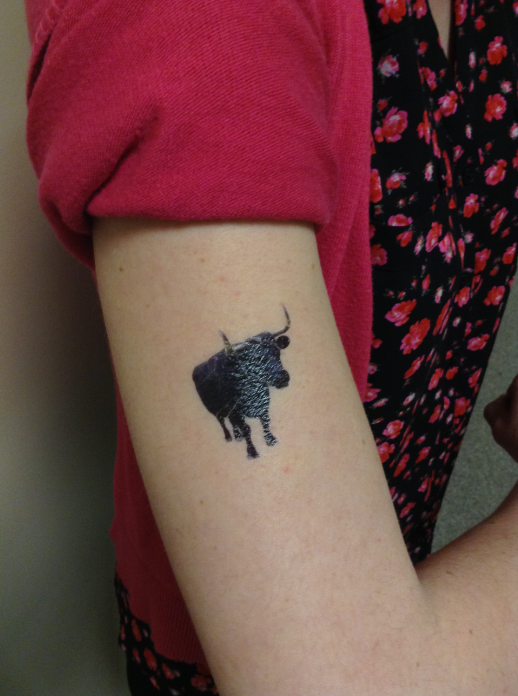 If that doesn't bring a smile to your face, then maybe a "Bill the Ox" temporary tattoo will do the trick. The Pennsylvania Lumber Museum was included in a community report segment produced by Blue Ridge Communications 13 - the segment features site administrator Josh Roth showing off the visitor center exhibit and the grounds of the museum. The video is available on YouTube (or watch it below); the Lumber Museum segment is the first 10 minutes or so. Great local coverage. Today (2/24), State Museum of Pennsylvania, Nature Lab Program. In honor of National Engineering Week, today's program is "Simple Machines." Included in regular admission. 11:30 am-12:30 pm. Saturday (2/25), Drake Well Museum. This month's "Something More Saturday" explores parlor games and other low-tech entertainments, included in regular admission. Special rate: purchase two adult tickets, receive up to three youth admissions. 10 am-3 pm. Check out the February program page if you're looking for things to do (I've included events for this weekend below, but you may want to plan ahead for next weekend.) Most Trails of History sites will be closed on Monday, Feb. 20, for Presidents Day, but Fort Pitt Museum and the Railroad Museum of PA will be open. Today (2/17) is "Day of Facts," an international social media event in which "museums, libraries, archives, cultural institutions, science centers and other trusted public sources of knowledge will share mission-related content using the hashtag #DayofFacts." (You can read more about it on the #DayofFacts blog.) Several sites on the Trails of History will be participating among hundreds worldwide to focus attention on primary sources, data, and research that underpins the work we do. Check out @PHMC on Twitter or Drake Well Museum, Ephrata Cloister, or the Pennsylvania Lumber Museum to see what's up. PHMC's annual report for fiscal year 2015-16, Small Budget, Big Impact, is now available online. You may also want to watch the Pennsylvania Trails of History Facebook or Twitter page for posts about the scope of services PHMC provides to Pennsylvania, using the hashtag #PHMCbigimpact. Please help spread the word. As part of their recurring "Hidden History" feature, WBRE and WYOU in the Scranton/Wilkes-Barre area broadcast a report earlier this week by reporter Crystal Cramore, who visited the Anthracite Heritage Museum. Cramore spoke with Chester Kulesa (recently retired as site administrator) about coal sculptures by artist C. Edgar Patience that are part of the museum's collections and exhibits. Cramore also spoke with Patience's niece, Christine Patterson, who is researching a book on African American coal miners in northeastern PA. This story will be part of an hour-long "Hidden History" special airing at 7 pm on Feb. 25 on WYOU and at 11 am on Feb. 26 on WBRE. The Tall Ships Erie 2016 festival recently was awarded Tall Ships America's Economic Impact Award in recognition of a highly successful event last fall. The Erie Maritime Museum and U.S. Brig Niagara hosted this event (and a successful event in 2013), with leadership from the Flagship Niagara League. According to an article on GoErie.com, VisitErie estimated that the event "generated more than $8 million for Erie's economy." Mayor Joseph Sinnott also presented The Flagship Niagara League with an official proclamation from the City of Erie that noted the tremendous economic contribution of the Tall Ships Festival. Erie will next host the festival, which rotates among Great Lakes, Atlantic, and Pacific venues, in 2019. Erie Maritime Museum and U.S. Brig Niagara, Wintertime at the Maritime: shake those winter blahs tonight. Details and link for online ticket sales on the museum/ship website. 6-10 pm. PA Lumber Museum, Snowmobile Weekend (continues through Sunday): explore snowmobile trails in the area, then park at the museum to enjoy warming beverages and check out the exhibits and films in the visitor center. More info. State Museum of PA, Learn at Lunchtime: enjoy the new planetarium show, "Compass, Calendar, Clock," included in regular admission, 12:15 pm. Anthracite Heritage Museum, Lackawanna Audubon Society: program is "Uganda, South Africa, and the Great American Solar Eclipse on Aug. 21, 2017." Program is free; admission charged to visit museum exhibits. 2:30 pm. Daniel Boone Homestead, Fireside Stories: geared for children ages 4-8 and their families. Featured story is Cinderella. Dress for the weather and bring an extra blanket if it’s really chilly. Cookies, hot cocoa, coffee, and tea will be served. Program is free; donations are welcome. 2 pm. Washington Crossing Historic Park, George Washington's Birthday Celebration: children are encouraged to bring homemade cards for GW, who will be marking his 285th birthday. At 1 pm, the General will be on hand to receive birthday wishes and cut the birthday cake, which he will share with well-wishers. Admission is $1. 10 am-2 pm. The February program page has info on events coming up between now and the end of the month. The forecast for my part of PA didn't quite live up to the hype, but it was enough to cover us with a lovely blanket of snow. And disrupt routines a bit. Since I spent Thursday at Ephrata Cloister, I was able to take a few photos. Congratulations are due to one of our sibling blogs here at PHMC. This Week in Pennsylvania Archaeology has been listed as one of the Top 50 Anthropology Blogs by Feedspot, based on search and social metrics. TWIPA reports on activities of the State Museum's Section of Archaeology and their work to promote an understanding of the role of archaeology in the study and preservation of heritage. The When You Work at a Museum blog has announced the schedule for "Museum Dance Off 4: A New Hope." As you may know, this is an international contest (although most of the entries come from the U.S. and Canada) in which folks from galleries, libraries, archives, and museums (GLAM) pick a song and produce a dance video that highlights their institution's collections, exhibits, programs, or other activities. The rest of us get to participate by voting for our favorites and learning about other institutions in the process. Entries for this year's contest are being accepted through 11:59 PM EST on March 31. The organizers will begin posting videos for competition on April 17 (each round of voting lasts 24 hours). (Read more about submitting an entry or voting on the blog.) I'll include links in Trailheads as things get rolling in April. 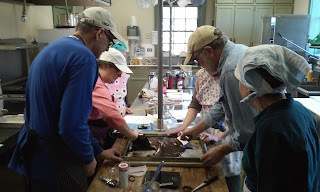 I spent much of last weekend learning how to make candy at Landis Valley Village and Farm Museum. 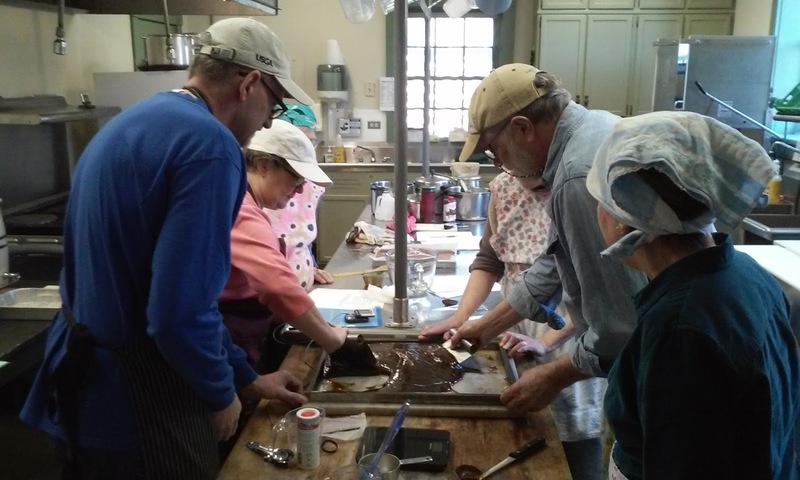 Under the skilled instruction of Dr. Susan Richman and assistance of Virginia LaFond and Shayla Carey, a small group of us learned to make toffee, salted caramel, buttercream, marshmallow, and coffee truffle fillings. Then we learned how to temper chocolate and enrobe the fillings. The basic class (as well as an advanced class) will be offered again as part of this year's Summer Institute (June 20-23), and I highly recommend it. Here's a little chocolate to sweeten your weekend. The February program page has info about upcoming events on the PA Trails of History. My thanks to Linda Bolla at the Erie Maritime Museum for text and photos related to our top story this week. Echoing Erie’s long relationship with significant events and ships of the U.S. Navy, at least once a year the Erie Maritime Museum is privileged to honor a request from service personnel to hold their reenlistment ceremony at the Museum or onboard Niagara. 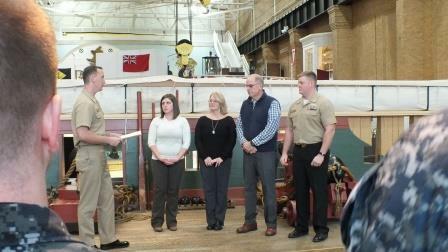 Last month, the Museum hosted an unprecedented four reenlistments in a two-week period. Captain James Bier, U.S. Marine Corps Reserves, administered the service oath for Staff Sergeant Kristina Perieff and Sergeant Steven Aceves on Jan. 13. 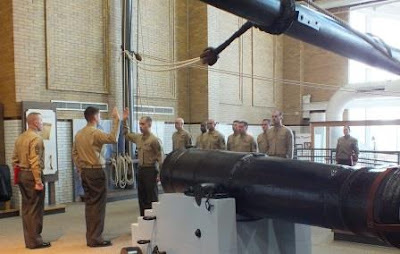 Museum docent Lieutenant Colonel Bill Koehle, U. S. Marine Corps Reserves (Ret’d), facilitated arrangements and gave a tour to the Marines directly following the reenlistment ceremony. Marines served in both Oliver Hazard Perry’s squadron at the Battle of Lake Erie and in USS Michigan throughout her long career on the Great Lakes, home port Erie [both stories are told in the Museum's exhibit galleries]. After the oath of service is given, another important award is always made for the families of active duty personnel. At BU2(SCW) Matthew Pfadt’s reenlistment ceremony on Jan. 19, his parents and fiancee were honored for their support and sacrifices. Matt's reenlistment ceremony and his wedding to Ashley were moved up on short notice as he is soon to be deployed to the Middle East. We wish Matt and his family the very best. 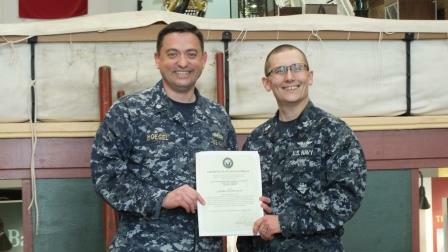 On Jan. 26, Petty Officer Jeremy Mong reenlisted and was promoted to “NC1” – Navy Counselor, First Class. Along with some of Petty Officer Mong’s colleagues, Lieutenant Commander Peter Hoegel drove to Erie from Pittsburgh to accept his reenlistment and commend him on his excellent work in recruitment. On a related note, we mentioned last week (or week before) that the Pennsylvania Military Museum (which also serves as a venue for military commissioning ceremonies) was hosting a town hall organized by the Department of Veterans Affairs. Site Administrator Tyler Gum recently received a thank you letter from the acting director of the VA's James E. Van Zandt Medical Center in Altoona, Charles Becker. Becker commended the museum staff and volunteers for their exemplary support of the event and their role in making it a success. "Your facility displays respect and reverence to our Nation's Heroes, and it was our honor to be associated with the Museum." Thank you all--active duty personnel, reservists, veterans, and families--for your service. And thank you to the staff and volunteers of the Erie Maritime Museum and the Pennsylvania Military Museum for your efforts in honoring our service personnel. The Railroad Museum of PA has reached a significant milestone in their $250,000 "Ready for the Roundhouse" campaign, which will support media blasting, painting, and repair of 5 PRR steam locomotives destined for exhibit in the new Roundhouse. The PA Railroad Technical and Historical Society challenged the Friends of the museum, saying they would match the first $50,000 raised when the campaign was announced in November. They set a deadline of April 15 for the Friends to raise their share. As of Jan. 31, $60,000 has been raised, triggering the match. Combined that puts the museum at not quite halfway to the ultimate fundraising goal. Congratulations to all concerned and thank you to PRRT&HS for their continued support. (Read more here from Lancaster Online.) If you'd like to help them get the rest of the way, you can donate online via the Museum website. On Wednesday, Feb. 1, State Sen. Art Haywood, State Rep. Jordan Harris, DGS Secretary Curt Topper, and PHMC officials marked the beginning of Black History Month by unveiling "Trailblazers: Notable African Americans in Pennsylvania History" at the PA State Capitol. The panel exhibit originated at the State Museum of PA. The State Historic Preservation Office has reported out some of the results of a public survey that will help inform the next statewide historic preservation plan (covering the period 2018-2022). You can read a summary of the results on the PA Historic Preservation blog; they'll be posting about more detailed analyses periodically in coming months. Undergraduate and graduate students wishing to be considered for this summer's Keystone Internship Program have until next Friday, Feb. 10, to submit their applications. The State Museum is accepting entries for the 50th Art of the State exhibit through Feb. 28. Submitting artists must be Pennsylvania residents. All entrants will be notified of the jurors' decisions no later than April 7. The exhibit runs from June 11 to Sept. 10.